Remember those retro-futuristic robots from outer space? That crazy love-baby of Joe Meek, Les Yper-Sound and Terry Terauchi? Well, they’ve done it again. We’re pushing out another 45 of Les Robots. This 7” will be a run-up to their first album, which we will release later this year. For now; two new songs, and we must admit, they are K-I-L-L-E-R! 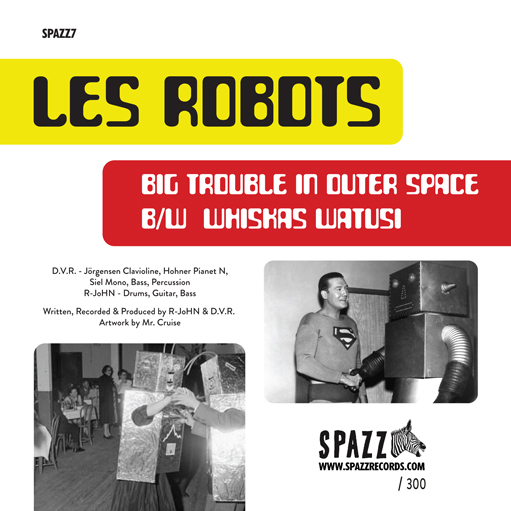 “Big Trouble In Outer Space / Whiskas Watusi” // PRE-ORDER: From Monday JAN. 21, 2019 // Release date: FEBRUARY 22, 2019. 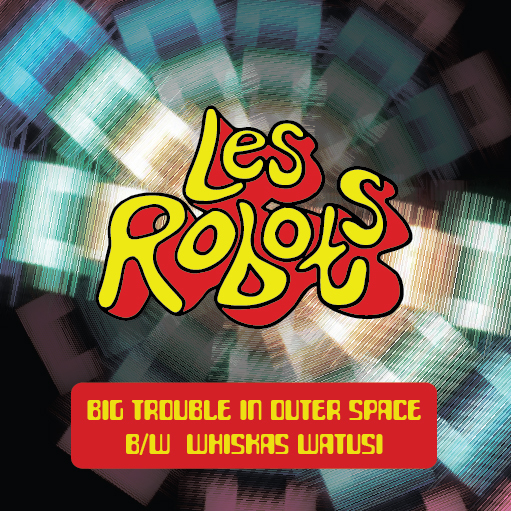 Les Robots is the alien outfit of programmed bots. It consists of mechanic writers duo D.V.R. and R-John and live-assets Pete-R and C.A.S.E. When we heard their first songs “Do The Robot!” and “One Way Ticket To The Moon” we could not resist to throw it on a 45! So we did (still available by the way!). Now the second one is on the way, before the first one sunk in. A batch of 300 copies will be pressed on 7” vinyl. But still, who are these robots? What are they doing here? And what do they want? Their precise whereabouts are unknown, yet what is known is that they hide out somewhere in The Netherlands ready to lure in their prey, and just when you are getting into that sound it hits you in the back of your head.